Swiss scientists who conducted tests on samples taken from Yasser Arafat’s body have found at least 18 times the normal levels of radioactive polonium in his remains. The scientists said that they were confident up to an 83 percent level that the late Palestinian leader was poisoned with it, which they said “moderately supports” polonium as the cause of his death. A 108-page report by the University Centre of Legal Medicine in Lausanne, which was obtained exclusively by Al Jazeera, found unnaturally high levels of polonium in Arafat’s ribs and pelvis, and in soil stained with his decaying organs. The Swiss scientists, along with French and Russian teams, obtained the samples last November after his body was exhumed from a mausoleum in Ramallah in the occupied West Bank. Dave Barclay, a renowned UK forensic scientist and retired detective, told Al Jazeera that with these results he was wholly convinced that Arafat was murdered. The Swiss report only examined the question of what killed Arafat. It did not address the question of whether he was deliberately poisoned or how. By October of 2004, towards the end of the second intifada, Arafat had been holed up for more than two years in his Ramallah presidential compound, which Israeli troops had surrounded and partly razed. He was elderly and frail but his medical reports show he “was in good overall health and did not have any particular risk factors,” the Swiss report states. On the evening of October 12, Arafat suddenly fell ill after eating a meal. Based on his symptoms – nausea, vomiting and abdominal pain – his personal doctor initially diagnosed flu. But Arafat’s health deteriorated swiftly and Egyptian and Tunisian doctors flown in to see him could not pinpoint the source of his sickness. On October 29, a wan and weak Arafat was carried in a wheelchair from his headquarters. He waved and blew kisses to the crowd outside and flew to Jordan by helicopter. From there a French government plane carried him to Paris for emergency treatment at Percy military hospital. French doctors were unable to diagnose or halt Arafat’s decline and he soon lapsed into a coma. 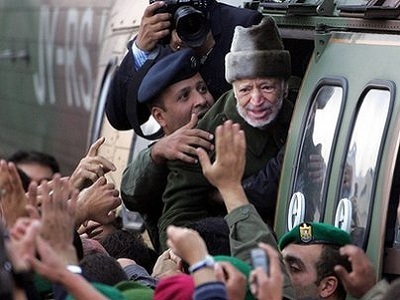 On November 11, Arafat, who symbolized the fight for Palestinian statehood, died at the age of 75. Doctors at Percy hospital did not conduct an autopsy, announce the cause of death or release his medical records, which heightened speculation about the cause of his rapid demise. Many Palestinian officials close to Arafat believed he had been poisoned. In the West, rumors circulated that he had died of Aids. Some doctors suggested leukemia or a food-borne illness had killed Arafat; others proposed that he had simply succumbed to old age. By 2011, when Al Jazeera began an investigation, Arafat’s death was a cold case. During the investigation, Suha Arafat gave the network access to her late husband’s full medical records and a bag of his belongings, including clothing he wore during his final days. Tests conducted by the Swiss scientists who issued the new report found elevated levels of polonium-210, one of the element’s isotopes, in blood, sweat and urine stains on Arafat’s clothes. In July 2012, Al Jazeera broadcast the results of its investigation in What Killed Arafat? The documentary triggered a French murder investigation and led to the exhumation of Arafat’s remains. Sixty samples of his body tissue were taken and twenty each distributed to the Swiss team, a French team of judges and forensic experts assigned to the murder investigation, and a Russian group invited at the request of the Palestinian Authority. The Russians are expected to disclose their results soon. The French are not expected to release their results before the murder investigation concludes. Saad Djebbar, Suha Arafat’s lawyer, said the Swiss report was a “significant piece of the jigsaw puzzle” that could help the French murder inquiry. Polonium is a soft, silvery-grey metal found in uranium ore. The isotope polonium-210 emits highly radioactive alpha particles, but they do not travel more than a few centimetres in air and are “stopped by a sheet of paper or by the dead layer of outer skin on our bodies,” says the International Atomic Energy Agency. For that reason polonium-210 is not a risk to human health as long as it remains outside the body. But a dose of 0.1 of a microgramme – the size of a speck of dust weighing less than a millionth of a snowflake – would be fatal if it were ingested in food or liquids or inhaled in contaminated air. Only a handful of people are reported to have died from polonium poisoning. The most famous case involves Alexander Litvinenko, a former KGB officer turned dissident who received political asylum from the British government and lived in London. Litvinenko died in November 2006, three weeks after meeting several Russians, including a one-time KGB officer, at London’s Millennium Hotel. A British public prosecutor alleges that the Russians were acting at the behest of their government and poisoned Litvinenko by lacing his tea with polonium-210. Polonium-210 is “one of the most obscure, most bizarre, and yet most merciless of poisons,” writes Alan Cowell in The Terminal Spy, a book about the Litvinenko case. It was used as a trigger for early nuclear weapons and subsequently as a power source for satellites and spacecraft. However, polonium-210 is extremely rare and would be difficult to obtain without the help of a government or access to a nuclear reactor. It also requires considerable scientific know-how to handle in a safe manner. Polonium-210 is manufactured by bombarding bismuth-209 with neutrons in a nuclear reactor. Only about 100 grammes are produced each year, almost all in Russia. In terms of motive, the chief suspects would be Arafat’s Palestinian rivals or the Israeli government, his sworn enemy. Ariel Sharon, the prime minister in 2004, viewed Arafat as a “terrorist” and called his death “a turning point in Middle Eastern history”. A year earlier, then-Deputy Prime Minister Ehud Olmert said killing Arafat ”is definitely one of the options”. However, Israel has always vehemently denied it had anything to do with Arafat’s sickness or death and to date no evidence has emerged that implicates it. While Barclay expressed confidence in the cause of death, he said it would be a difficult case to solve.